Sunday June 4 1911 Came home at 6 and was at work most of the forenoon. Winnie out for supper and I went back with her to sleep with Mother. I slept in afternoon awhile. 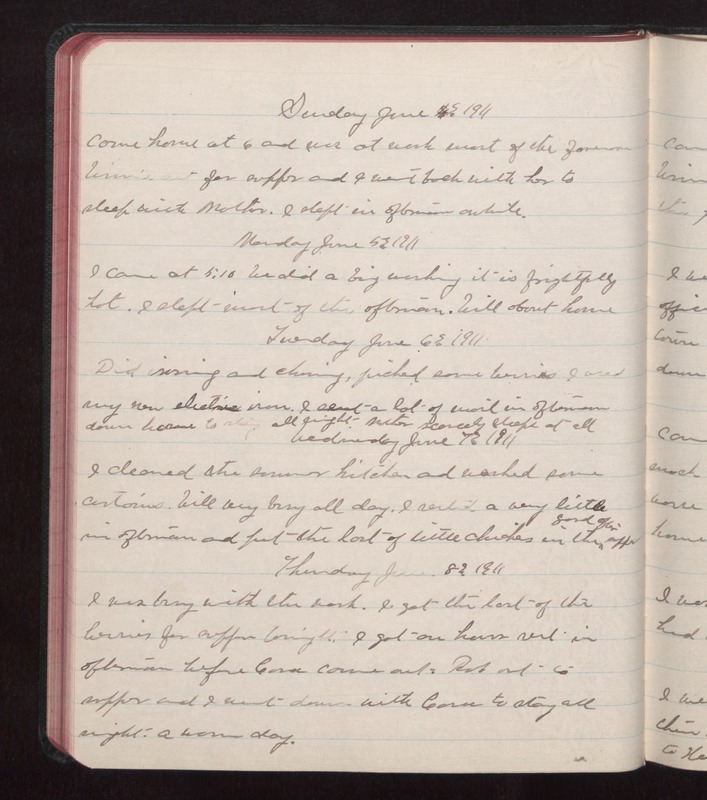 Monday June 5 1911 I came at 5.10 We did a big washing It is frightfully hot. I slept most of the afternoon. Will about home. Tuesday June 6 1911 Did ironing and churning, picked some berries I used my new electric iron. I sent a lot of mail in afternoon down home to stay all night. Mother scarcely slept at all Wednesday June 7 1911 I cleaned the summer kitchen and washed some curtains. Will very busy all day. I rested a very little in afternoon and put the last of little chickens in the yard after supper. Thursday June 8 1911 I was busy with the work. I got the last of the berries for supper tonight. I got an hours rest in afternoon before Cora came out. Rob out to supper and I went down with Cora to stay all night. A warm day.